I believe "Midnight Hour" was actually played on the 7th of June at Bill Bruford's first gig with the band. In the 'YesYears' documentary (1991), Bruford recalls his first show, at the Rachel Macmillan College, Deptford, London. However, the group was still called Mabel Greer's Toyshop at this time, with John Anderson (vocals), Clive Bayley (guitar, vocals), Chris Squire (bass, vocals) and Bruford taking over from Bob Hagger (drums) who had left a few days previously. Peter Banks (guitar) had recently left the group, to join Neat Change, shortly after Anderson's first gig with them, which was at St. Joseph's Hall, Highgate, London on the 18th of May. Tony Kaye (organ) joined Mabel Greer's Toyshop in mid-July, making them a five-piece group, and they played a show at Market Hall, Kingston, London on the 20th of July. Shortly after this, Bayley left and Banks returned from Neat Change. Two gigs scheduled for around this time were cancelled, probably due to the transition of guitarists; Bracknell Sports Centre (26th of July) and Newmarket Municipal Hall (27th of July). The line-up of Squire-Anderson-Bruford-Kaye-Banks rehearsed at the Lucky Horseshoe Cafe, Shaftsbury Avenue, Soho, London for three days from the 31st of July to the 2nd of August. 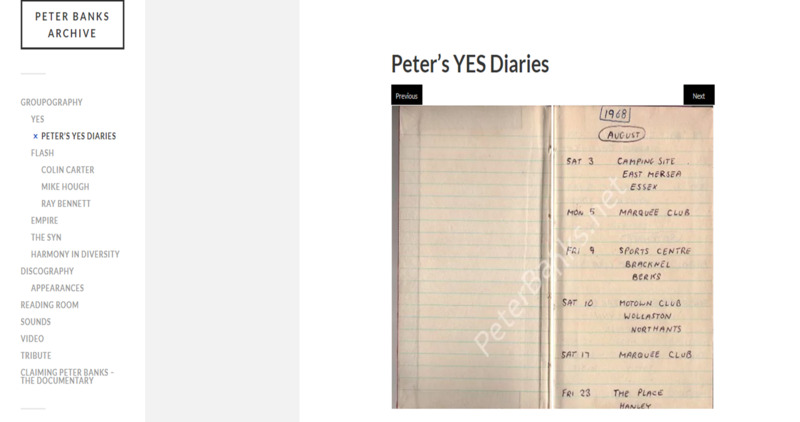 By the end of the rehearsal on the 2nd of August 1968, they had changed their name from Mabel Greer's Toyshop to Yes, playing their first gig as Yes the following day. And I read once somewhere that Yes did a 10-minute version of an old Wilson Pickett tune called "In the Midnight Hour". You've heard it I'm sure. I love the song to begin with, and I'd like to hear Yes do a really cool, laid-back version of it.